Himeji is located west side of Hyogo Prefecture. Himeji is originally a castle town with Himeji Castle, a UNESCO World Heritage SIte and National Treasure of Japan and the most beautiful Castle in Japan. Other attractions including the Engyo-ji temple, Mount Seppiko, Himeji Central Park, and Koko-en Garden. There are also many ruins which you can feel the time of Castle Town. In front of the Himeji Castle, there is big shopping districts which you can buy great sweets of Himeji. 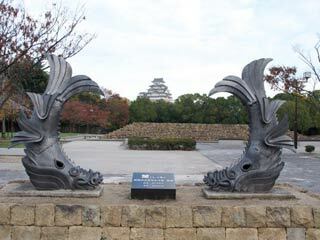 Himeji Castle (姫路城 Himeji-jo), (An easy 10-minute walk north from the station; also accessible by bus.). The castle is open 9 AM to 4 PM daily or until 5 PM from June until August (The castle is closed between December 29 - 31.). Dating to 1609 and also graced with the name ( 白鷺城 Shirasagi-jo), this striking white edifice is generally considered the most beautiful of Japan's castles and is one of the few that has escaped the ravages of civil war, earthquakes and firebombings. The castle was designated as a national treasure in 1931 and was registered as a UNESCO World Heritage site in 1993. It is virtually the last castle in Japan that still manages to tower over the surrounding skyscrapers and office buildings. Admission is 600 yen adults and 200 yen children. A special 720 yen combination ticket gets you into both the castle and the nearby Kokoen Garden. A free guided tour in English is included ''if'' a guide happens to be available (no reservations are possible). Himeji Castle is under renovation from fall of 2009 until 2014. It will stay open throughout, but parts may be off-limits and a large tent-like structure will cover most of the castle from March 2010 until renovations are completed in 2014. Kokoen Garden (好古園 kokoen), (Located right next to the western edge of Himeji Castle's outer moat). Open from 9 AM daily and closes at either 5 PM or 6PM (last admission at 4:30 PM or 5:30 PM) depending on the time of year. This magnificent collection of nine Edo-period-style walled gardens was laid out in 1992 on a site where samurai houses once stood. The street plan and gated partitions preserve the appearance of the old residential quarter, except that within the various enclosures visitors find beautifully landscaped gardens and water features instead of noble residences. There is a tea arbour and a restaurant within the grounds, but eating and drinking outside of these places is prohibited. Admission is 300 yen adults and 150 yen children. A special 720 yen combination ticket gets you into both Kokoen and Himeji Castle.